Michael Höltzel is a soloist, an orchestral and chamber music artist, a conductor, and an influential teacher. He has also established a number of chamber music ensembles and symposiums. Höltzel was born in 1936 in Tübingen, Germany. After high school, he studied horn and viola at the Hochschule für Musik in Stuttgart, completing his studies in horn and conducting at the Mozarteum in Salzburg. He was solo horn with the Camerata Academica in Salzburg, the Orchestra Palazzo Pitti Florence, the Bamberg Symphony, and the Munich Philharmonic. His studies included the wind chamber music class of clarinettist Philip Dreisbach in Stuttgart, where he also benefited from musical lessons with Hans Köhler, violist with the Wendling Quartett. In Salzburg he learned Mozart from Bernhard Paumgartner, president of the Internationale Stiftung Mozarteum and of the Salzburg Festival and conductor of the Camerata Academica. As a result of these studies, Höltzel founded and directed the Wind Ensemble of the Bamberg Symphony. In the summer of 1970, Höltzel wanted to study with Philip Farkas at Indiana University. After Farkas and Dean Bain had listened to the audition tape (Haydn's first horn concerto with the Bamberg Symphony Orchestra), they refused Höltzel as a student, but hired him as a visiting teacher instead. In 1972, Höltzel was soloist and conductor of the Mozart four concertos and Concert Rondo with the Camerata Academica Salzburg, after which the orchestra offered him the position of principal conductor (until 1975). 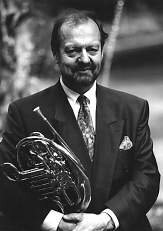 Höltzel has been professor of horn and chamber music at the Hochschule für Musik in Detmold (1973-1999), Indiana University (1970-71, 1975-76, 1980-81, 2005-06), and currently at the Hochschule für Musik and Theater Rostock as well as the Hochschule für Musik Trossingen. He has conducted numerous chamber music courses (Salzburg, Bloomington, Weimar, Bobbio, Tokyo, Bologna, etc.). Many of Höltzel's former students have become award winners and play in major symphony orchestras: Radovan Vlatkovic, Eric Terwilliger, Daniel Katzen, Bruno Schneider, Esa Tapani, Alessio Allegrini, and others. Höltzel appears frequently as guest conductor with various symphony and chamber orchestras, and with ensembles such as the Piccola Academia di Roma, the Wind Academy Sachsen in Chemnitz, the winds of the Hamburg Symphony, and the Radio-Symphony Orchestra Helsinki, Finland. Höltzel has founded various chamber music ensembles, such as the Detmolder Hornisten, Gran Partita Detmold, and Detmolder Serenadenensemble. Several of his CDs have been issued by the MDG label, including Le Grand Sextuor by Dauprat with his Detmolder Hornisten and Romantic Music for Horn and Piano with Friedrich Wilhelm Schnurr. In 1980, Höltzel hosted the First European Horn Symposium in Trossingen and in 1986 was host for the IHS Symposium in Detmold. Together with his wife, Petra Mendes, he organized the International Horn Festival 2000 in Detmold and is co-founder of the International Horntage that takes place every two years (established in 2002). Höltzel's method for horn (Hohe Schule des Horns) has been published by Schott International in three volumes. The third volume, which was awarded a German Book Prize in 2001, is available in English asMastery of the French Horn: Technique and Musical Expression. Höltzel has served on the IHS Advisory Council (1976-1982 and 1988-1991) and as Vice President (1978-1981). He was elected an IHS Honorary Member in 2009.